A fiasco threatens to spiral out of control. 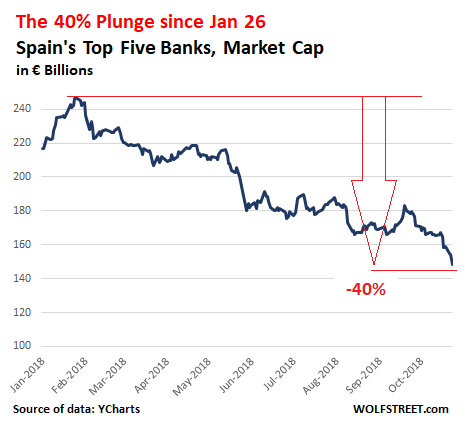 In the last five trading days, the shares of Spain’s five largest listed banks have re-energized their plunge that had started at the end of January and now amounts to 40%. The cause for the recent drop? A shock ruling by Spain’s Supreme Court that lenders, rather than mortgage borrowers, should pay the contractual tax on mortgage loans, on the grounds that the lender is the only party with an interest in getting the loan certified by a notary, since this is what enables the bank to begin foreclosure proceedings if the borrower defaults on payments. On Monday, the Supreme Court announced that it won’t decide who has to pay the tax on mortgages — the banks or the borrowers — until November 5. In other words, there will be two more weeks of acute legal uncertainty.